On top of having this super cool cover, within these pages I discovered some of the best short, dark fiction I've read in a long while! Let's talk about it, shall we? When I was young and couldn't afford bookstores, I often went to the library. (I still do, actually, because I love them, not because I have to.) I developed a love of horror back then, but our library's collection consisted of about two shelves. Once I read those, I started reading all of their anthologies and collections, in the hopes of finding new authors. In this way, I discovered Richard Matheson, Steve Rasnic Tem, Dennis Etchison, Ray Bradbury and other writers that I still love to this day. DARKEST HOURS brought me back to that time of discovery-horror and dark fiction in all of its glorious, different forms. Reading this collection made me feel like a kid again. This volume begins with the story HAIR. I knew right then that this book was going to be a force to be reckoned with. Coming unapologetically out of left field, Thorn hits you with this tale of unstoppable hair and then moves on to something out of right field, just to keep you off balance. CHOO CHOO This story felt like it came out of one of those early collections that I loved so much. With an ending so unexpected that it felt like I got hit by a train, this tale made me laugh out loud with glee. LONG MAN I never thought anything could compete against the Long Walker in my imagination. (Thank you to Nick Cutter's Little Heaven for that.) But now, now we have Long Man. He's even scarier-trust me on this. ECONOMY THESE DAYS Here again is another story, completely different, completely unlike any other story here. How much physical abuse would you be willing to take to pay your bills? What would that abusive job look like? Of what would a promotion consist? This tale proposes answers to all of those things and oddly, I don't think it's that far out of the realm of possibility. SABBATICAL If I hadn't felt the spirit of Stephen King in this story, the main character's names of Thad and Gage would've put me in mind of him anyway. I cannotdescribe this story, but it was just so much fun it made me want to do some kind of dance-the dance of my dark fiction people. The dance is delightful and it's only brought on by the best and most twisted of tales. This is one of them. and screaming will not help. His mind screamed, but his sutured lips twitched noiselessly. If that sentence doesn't bother you, okay then, to each his own. However, if that sentence makes you want to run out and buy this book, heed your feelings, man! You won't be disappointed. There are a few themes that became apparent throughout this book, academia being the one that surprised me the most, but also: hair. I don't remember ever reading a collection where simple hair is used in such a menacing, disgusting, or just mentioned in passing but still in a creepy-as-hell- kind of way. Okay then-to sum up: disturbing tales? Check! A wide-ranging variety of stories? Check! Extremely well written? Check! It almost seems like this collection was written with me in mind-it was so perfect for me that I don't even know what else to say. 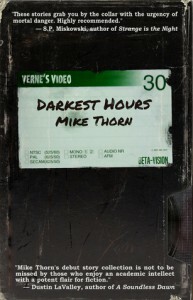 Well, other than this: I think Mike Thorn is an author to watch. I think he's going to do great things in the world of horror and dark fiction, and I for one, will be there to watch it. Will you?